At CareMinders "Life at Home Is The Key To Independence"sm. We are dedicated to enhancing the quality of life through delivering compassionate skilled and non-medical care to clients at home. Our trained and dedicated staff continuously strive for excellence. CareMinders® provides for the safety and security of clients, regardless of age, by offering home support services and personalized care as well as harmonious companionship. Beginning with the very first encounter we build relationships with a goal of providing the highest quality of care, second to none. CareMinders consistently exceeds every requirement for providing care in this industry. We do this not because we have to, but because we believe our clients deserve the very best in service delivery. Our caregivers are with their clients from a few hours a day to around the clock continuous care. CareMinders' special assistance is dedicated to the elderly, infirm, or convalescing clients in the comfort of their own home. We have designed our services to help clients maintain their chosen lifestyle and sense of freedom enjoyed prior to their injury, illness, or declining health. The desire to be in control of your life and healthcare is a strong motivator and CareMinders Home Care recognizes that. CareMinders® Home Care is a Promoter of Joint Commission Accreditation. Working with the Joint Commission, CareMinders® Home Care assists its franchisees in becoming accredited and complying with the Joint Commission's high quality standards. You will provide a comprehensive case management approach to every client. This is a unique method of coordinating and delivering care and services to clients who have needs outside the scope of our care. A Quality and Performance Improvement Program that is designed to evaluate and improve the care provided using specific outcome oriented goals. Our emergency management planning process prepares clients and families for everything from medical emergencies to natural disasters. CareMinders® Home Care will stand behind you from your very first contact with us. We will assist you throughout your planning stage and be there when you become a franchisee. You will attend CareMinders® University for training and we will be standing beside you during your grand opening. We will be there to provide you with ongoing support & training for the systems and tools you need to build your CareMinders® Home Care franchise. We will help you learn our superb marketing program and state of the art operations programs. As a CareMinders® Home Care franchisee, you will become part of a winning and united team - a team that is strong, growing and responding to exciting and challenging opportunities the home care Industry has to offer. We are looking for entrepreneurs who are ready to be in business for yourself, yet not by yourself. If you have a desire to help others who need some extra care then you might be a right fit for CareMinders Care Givers. Does the idea of starting a new career and launching your own business at the same time seem to be an overwhelming challenge? Going it alone is more challenging and tougher than most people would expect. Because of this, CareMinders Caregivers franchising should seem very appealing. Our well run franchise system with a proven concept in this growing industry can help to reduce your stress of managing the challenges and risks of starting a business because so much of the work is done for you. "IMPORTANT: For those reading this advertisement, and subsequently wanting additional information about CareMinder Home Care’s opportunities, please complete the form to the right. With our receipt of your information, we will be in contact with you almost immediately to verify with you the information you have submitted. Following the verification process, you then will be contacted by Mr Ken Elias, an affiliate of CareMinder Home Care a professional consultant, who will give you more information about the CareMinder Home Care business opportunity with no cost or obligation to you. Thank you for your interest." 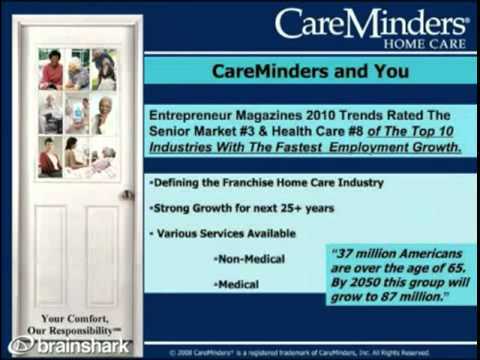 Please Note: This CareMinders Home Care advertisement, and all other franchise opportunities, franchises for sale, business opportunities, businesses for sale, franchise financing providers, and other advertisements on this website should not be considered an offering or solicitation, and they are not recommended, endorsed, or approved in any way by TopInternationalFranchises.com. All listings and advertisements on this website are submitted to TopInternationalFranchises.com by the franchise, business opportunity, business for sale or other advertiser, and that information is relied entirely on for the truthfulness and accuracy of the information provided. TopInternationalFranchises.com has no stake in these companies, and have not independently verified any of the information submitted, no responsibility for its accuracy or completeness is assumed by TopInternationalFranchises.com. Persons submitting the inquiry form are under no obligation to purchase or otherwise utilize any services offered, they are simply requesting more information on the franchises or business opportunities listed. Please review the full advertisement before responding. I'm interested in starting a CareMinders Home Care franchise in my area: , * My State Alabama Alaska Arizona Arkansas California Colorado Connecticut Delaware Florida Georgia Hawaii Idaho Illinois Indiana Iowa Kansas Kentucky Louisiana Maine Maryland Massachusetts Michigan Minnesota Mississippi Missouri Montana Nebraska Nevada New Hampshire New Jersey New Mexico New York North Carolina North Dakota Ohio Oklahoma Oregon Pennsylvania Puerto Rico Rhode Island South Carolina South Dakota Tennessee Texas Utah Vermont Virgin Islands Virginia Washington Washington DC West Virginia Wisconsin Wyoming International Alberta British Columbia Canadian Manitoba New Brunswick Newfoundland and Labrador Northwest Territories Nova Scotia Nunavut Ontario Prince Edward Island Quebec Saskatchewan Yukon New South Wales Northern Territory Queensland South Australia Tasmania Victoria Western Australia * My Country United States Canada Afghanistan Albania Algeria American Samoa Andorra Angola Anguilla Antarctica Antigua and Barbuda Argentina Armenia Aruba Australia Austria Azerbaijan Bahamas Bahrain Bangladesh Barbados Belarus Belgium Belize Benin Bermuda Bhutan Bolivia Bosnia and Herzegovina Botswana Bouvet Island Brazil British Indian Ocean Territory Brunei Darussalam Bulgaria Burkina Faso Burundi Cambodia Cameroon Cape Verde Cayman Islands Central African Republic Chad Chile China Christmas Island Cocos (Keeling) Islands Colombia Comoros Congo Congo, the Democratic Republic of the Cook Islands Costa Rica Cote D'Ivoire Croatia Cuba Cyprus Czech Republic Denmark Djibouti Dominica Dominican Republic Ecuador Egypt El Salvador Equatorial Guinea Eritrea Estonia Ethiopia Falkland Islands (Malvinas) Faroe Islands Fiji Finland France French Guiana French Polynesia French Southern Territories Gabon Gambia Georgia Germany Ghana Gibraltar Greece Greenland Grenada Guadeloupe Guam Guatemala Guinea Guinea-Bissau Guyana Haiti Heard Island and Mcdonald Islands Holy See (Vatican City State) Honduras Hong Kong Hungary Iceland India Indonesia Iran, Islamic Republic of Iraq Ireland Israel Italy Jamaica Japan Jordan Kazakhstan Kenya Kiribati Korea, Democratic People's Republic of Korea, Republic of Kuwait Kyrgyzstan Lao People's Democratic Republic Latvia Lebanon Lesotho Liberia Libyan Arab Jamahiriya Liechtenstein Lithuania Luxembourg Macao Macedonia, the Former Yugoslav Republic of Madagascar Malawi Malaysia Maldives Mali Malta Marshall Islands Martinique Mauritania Mauritius Mayotte Mexico Micronesia, Federated States of Moldova, Republic of Monaco Mongolia Montserrat Morocco Mozambique Myanmar Namibia Nauru Nepal Netherlands Netherlands Antilles New Caledonia New Zealand Nicaragua Niger Nigeria Niue Norfolk Island Northern Mariana Islands Norway Oman Pakistan Palau Palestinian Territory, Occupied Panama Papua New Guinea Paraguay Peru Philippines Pitcairn Poland Portugal Puerto Rico Qatar Reunion Romania Russian Federation Rwanda Saint Helena Saint Kitts and Nevis Saint Lucia Saint Pierre and Miquelon Saint Vincent and the Grenadines Samoa San Marino Sao Tome and Principe Saudi Arabia Senegal Serbia and Montenegro Seychelles Sierra Leone Singapore Slovakia Slovenia Solomon Islands Somalia South Africa South Georgia and the South Sandwich Islands Spain Sri Lanka Sudan Suriname Svalbard and Jan Mayen Swaziland Sweden Switzerland Syrian Arab Republic Taiwan, Province of China Tajikistan Tanzania, United Republic of Thailand Timor-Leste Togo Tokelau Tonga Trinidad and Tobago Tunisia Turkey Turkmenistan Turks and Caicos Islands Tuvalu Uganda Ukraine United Arab Emirates United Kingdom United States Minor Outlying Islands Uruguay Uzbekistan Vanuatu Venezuela Viet Nam Virgin Islands, British Virgin Islands, U.s. Wallis and Futuna Western Sahara Yemen Zambia Zimbabwe .